Featuring an elegant decor and a warm hospitality, First Hotel welcomes you for an unforgettable vacation. Location The First Hotel Skt Petri is located in the heart of Copenhagen, close to prime pedestrianised shopping areas, the Round Tower and Town Hall Square. 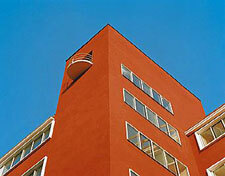 The hotel also offers a wide variety of choice for both resident guests and Copenhageners alike. Rooms This hotel provides 268 rooms equipped with all necessary amenities that is expected from any visitor. Restaurant The Brasserie Bleue is a restaurant with unique modern decor featuring a soft ambience with lounge music and serving sophisticated Danish-French cuisine. The Bar Rouge at First Hotel Skt Petri is one of the most popular cocktail bars in Copenhagen, resulting in an extraordinary buzz and music especially during Friday and Saturday nights. Fantastic Hotel. Beautiful Scandinavian design. Cozy rooms with lovely views (although they are a bit small). Extremely helpful, friendly and attractive staff. Perfect location. General The hotel is the ideal venue for small meetings, large conferences, fashion shows, and product launches and grand receptions for up to 270 guests.